By the time Thanksgiving gets here, whitetailed bucks in our region have been pressured beyond belief. Half of archery season has passed and the first firearm season saw thousands of bullets flying through the air. So even though the bucks have felt the pressure that hunters apply, there is still a large portion of deer season remaining. Both archers and muzzleloader hunters still want nice bucks. 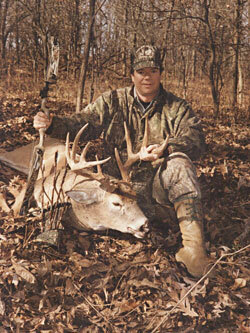 In "The Show-Me State" we still have the muzzleloader season and archery as well. How do we go about finding mature bucks that have been recently educated by hunting pressure? Recognizing the pressure is the first step. Anything that moves a buck off his daily pattern, be that moving, feeding or bedding, is considered pressure. Even though deer hunters apply most of that pressure, other normal human activities in the fall of the year also contribute to deer disturbance. Farmers going about harvest, wood cutters and upland game hunters all force deer to change their routines, thus causing pressure. Mature bucks will likely react to this pressure in one of three basic instinctive behaviors. The buck will either move to heavier cover, move to a different piece of property or go strictly nocturnal. Regardless of which behavior the buck chooses to exhibit, his senses will be heightened to their most sensitive levels. This combination of events makes the buck very hard to find. The best way to prevent pressure on a deer is to eliminate it. Reduce your non-hunting trips into his territory. When you do have to go there, make lots of noise and move slowly. This will give him time to sneak away, making him feel more in control and less pressured. If he is comfortable that he has outsmarted you, he will probably return to the area. 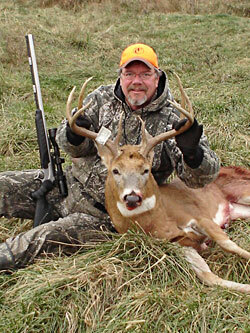 You should also consider the placement of your stands when hunting pressure-educated deer. 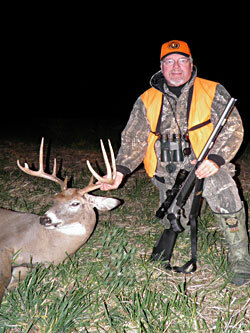 Early in the season and during the rut, deer movement is very good. Putting your stand in a spot to give you a good view of several acres is the best plan. But later on you should move into thicker cover, anticipating that the bucks will do the same. A pressured buck will commonly do very little moving around during the day. Having your stand placed where the cover gives the deer a sense of security may present you with shots you may not have had otherwise. Your stand may be in cover so thick that you can only shoot 10 to 15-yards. But if he is there, that is plenty. Another thing to remember is to place your late-season stand so that you can get into it without tipping him off that you are there. Avoid going right through bedding and feeding areas. Skirt the perimeter and try to enter quietly. If you plan to hunt the same stand several days in a row, figure out different routes to and from the stand. Do not let the buck pattern YOU. We all know that we must fool a buck's nose to be successful. This sense is amplified in pressured deer. A buck will attempt to validate all incoming data with his nose. If he sees you and cannot smell you, you still have a chance. If he hears you and cannot smell you, you still have a chance. If he does not see or hear you, but can smell you, the game is quickly over and he wins...every time. So how do you keep late-season bucks from beating you with their nose? That's easy, you be very careful. You must not only remove as much of your scent as possible, you must also be very careful to mask or cover the rest. As always you must avoid adding any unnatural aromas to your already odoriferous person. Aftershave, shaving cream, scented soap, shampoo, cologne, deodorant and even chapstick must not be used. If you are serious about it you must do without these smelly products. To a deer you smell like a fish market at low tide. They despise the scent of humans and the products we use. Personally I love late season bowhunting. In fact, my favorite time of year to deer hunt is between Christmas and New Year's. The deer have begun to "herd-up" for winter. The rut and secondary rut have passed and the bucks are much more tolerant of each other's company. I find that this time of year I see more deer per day than any other. More even than in the rut. During the rut you may have a hot stand that sees one or possibly two mature bucks a day. Late in the season, when pre-winter feeding once again becomes the deer's priority, a good stand may see four, five or six shooters a day, depending upon the food source and location. If you can stay out of a prime feeding area for a week or two after the firearms season, then slip back in to bowhunt, you are likely to find deer going about their normal routine. Daytime feeding and moving is more common in the late season because finding food is now the instinct driving both the bucks and the does. The bucks especially have to feed longer each day to help them recover from the rut and to help them get ready for harsh weather that is coming. 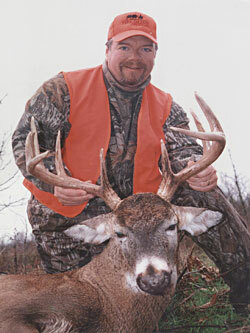 Hardwood stands close to cover and close to grain fields are the best bet for bucks. Pressured deer will feed and then bed, usually out of the wind and in the sun. A mid-December, sunny afternoon is a perfect time to ambush a buck on his way to a south-facing hillside nap. There is no substitute for planning. You must have your mind made-up that late-season, educated bucks are going to be harder to find. You have got to plan stand placements and entry routes well in advance of your hunt. Most of all you must realize that a mature white-tailed buck is a totally different species. He is more suspicious, more nervous and more likely to detect your presence than any other deer in the woods. He has every "home court" advantage. So your brain must be used to beat him. You must study him. You must understand him. Most of all, you must respect him for having survived long enough to become this magnificent trophy that you desire. And when you do win the battle with a heavy-pressured, late-season monster buck, you can spend all winter planning next season's strategy, knowing that you can win again.